Since April 2 is International Children's Book Day, what better way to celebrate than to seek out a copy of the endlessly fascinating Horrible Histories? 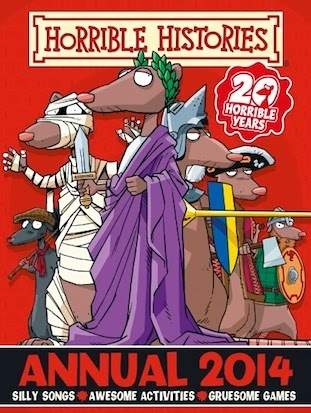 In particular today, I’d like to recommend: Horrible Histories Annual 2014 by Terry Deary and Martin Brown, published by Scholastic Children’s Books (2013) RRP:$19.99. New year. New nasty bits! Pep up your year with some horrible cheer! Celebrate 20 years of Horrible Histories with this bumper anniversary annual, packed with disgusting fun for die-hard fans. Gruesome games, revolting recipes, putrid puzzles and tasteless jokes galore. If you’re horrible, you’ve got to have it! I have seen children begin to take an interest in history because of books like Horrible Histories. The zaniness, the gore, and the quirky facts often lead them into further reading, too. I love that the Horrible Histories Annual 2014 has such a range of activities for kids, all featuring Brown’s hilarious illustrations. I defy your kids NOT to enjoy such ghastliness as a song about the Plague and ghost stories, snippets of advice on how to dress like a Tudor, suggestions on how to throw a putrid party, word games, cartoons, drawing challenges, and quizzes. Deary knows how to make kids laugh and enjoy themselves - even little details like choosing the ruthless rebel who tried to throw the English out of Scotland in 1297 and the multiple choice answers include Bruce Banner! Teachers and librarians are going to enjoy reading aloud snippets from the book when kids are learning about such diverse historical periods as Ancient Egypt through to WW2, mostly from a British perspective. Do buy this annual for kids who are not yet convinced they love reading! The variety, the humour and general mayhem, as well as the short chunks of text are highly likely to draw them in. You can read reviews by kids at the Scholastic UK website. Children can also play Horrible Histories games there, like Time Sewer Adventures, Viking Explorer and Moo Spew.